I’ve long been a firm believer in public health care for all. Why not? We’ve had hugely successful Social Security and Medicare for decades. Hugely successful, that is, until 30 years ago, when the Republican right wing first launched its crusade to undermine the effectiveness of these hard-earned rights, arguing that privatization would be more efficient and cost-effective. Last week, my belief in the need for health care for all was reinforced when I read a study showing that more than one in four hospital emergency departments had shuttered their doors in the last 20 years. Meanwhile, ER visits had grown by some 35 percent. Emergency departments at “for-profit” hospitals and those with “low profit margins” were nearly twice as likely to close as their counterparts. Those in the “more competitive markets” had a 30 percent higher risk of closing while those serving a disproportionate share of Medicaid and poor patients were 40 percent more likely. Clearly, corporate profit margins trump human life when it comes to the capitalist market. If the market can’t allocate health care resources “in an equitable way,” then what can? A publicly financed and administered health care system for all from top to bottom can. Health care’s sole aim should be to cure, save and improve lives, not to leave the ill and infirm to the mercy of a merciless capitalist market. But, for starters, I’d be happy with a government-run health insurance system for all (devoid of private insurance companies) that directly pays for-profit and non-profit health care providers, like Medicare now does for seniors. To be sure, big business would have to “sacrifice” with a small tax on its immense profits to finance the program. But, so be it. This approach would be far more efficient and cost-effective once the profit-fleecing health insurance companies are out of the picture altogether. Under the Canadian health system, which is similar to our Medicare for seniors, health care spending represents 10.5 percent of that nation’s GDP. Under ours, health care represents 16 percent of GDP. I’m not for squandering tax dollars. But, frankly, cost is a non-issue with me when it comes to human beings’ health in a country as rich as ours, so long as funds are spent wisely. By wisely I mean: not to subsidize high-priced medicines in order to enrich profit-hungry drug companies, for example. Already you can hear the right-wing naysayers. “It would destroy our choices in health care and force us to pay for and exclusively use a government-controlled socialist health care system,” the website of the Child and Family Protection Association (CFPA) blared recently. CFPA, which is in cahoots with the California Chamber of Commerce, was expressing its opposition to California Senate Bill 810, introduced by State Senator Mark Leno last month. 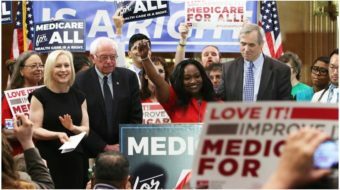 Today’s Medicare for seniors continues to enjoy widespread popular support, as shown by public opinion polls and widespread public protest to the recent Republican privatization voucher scheme. The fight to defend Medicare and public institutions today is a prerequisite for future battles to improve and expand the public sector. Every gain we’ve made since the 2008 historic elections must likewise be defended. That includes the Affordable Care Act, which itself is preparing the ground for the struggle to win Medicare for all in the future. If we hope to reverse the human toll, pain and grief that the closing of hospital emergency rooms is causing, and to protect and expand Medicare and other public institutions, we’d better make sure we inflict major losses on the Republicans and their far right corporate backers at the polls next year. As for the socialist-baiters, I say: I’m confident our nation’s working people, in time, will move to declare public health care for all a human right protected by a constitutional amendment. 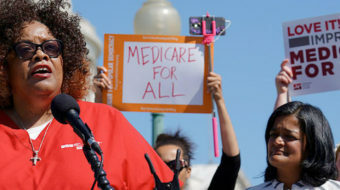 Once working people take direct control of our nation’s economic, political and public life under a socialist U.S.A., it will be a merciful public sector that will govern our nation’s health care system.